Gathering over 11 million admissions during its cinematic run, director Yang Woo-seok’s (양우석) highly impressive courtroom drama The Attorney (변호인) has certainly struck a chord with Korean audiences. Inspired by the early years of former president Roh Moo-hyun, the film explores the anti-communist witch hunts and suppression of human rights that targeted students during dictator Chun Doo-hwan’s regime. 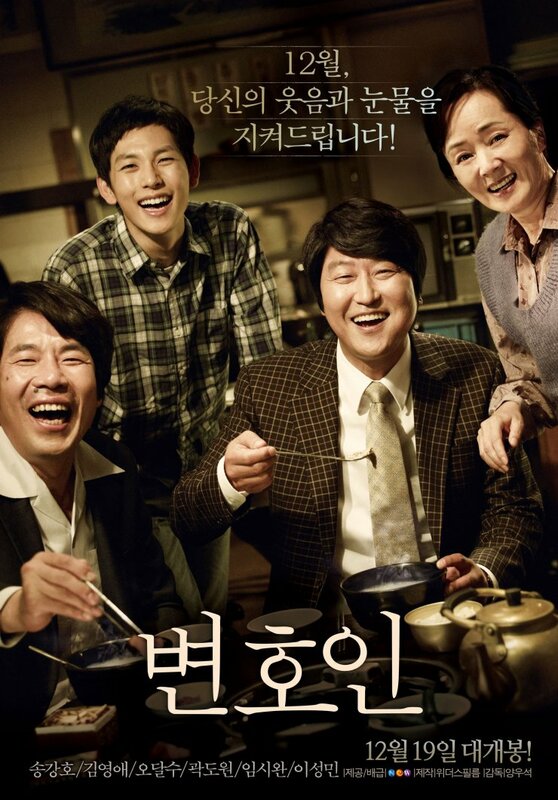 The Attorney has clearly struck a nerve with film-goers, many of whom were alive – and victimized – during the persecutions, and with regular protests held regarding current President Park-hye’s administration the film is timely indeed. The Attorney is an incredibly powerful film and a stunning debut for first-time writer/director Yang Woo-seok. The pacing and structure is wonderfully constructed as the underlying messages within are gradually introduced and explored through the central protagonists. The tendency to delve into melodrama is luckily side-stepped and the film is all the stronger for it, with actor Song Kang-ho providing a phenomenal performance that cannot fail to incite emotional resonance within audiences, Korean or otherwise. During the early 1980s, attorney Song Woo-seok (Song Kang-ho (송강호) is continually ridiculed by his peers for only graduating high school, yet they are soon embarrassed when Song’s ambition and drive to succeed places him as one of the top lawyers in Busan. As his business is on the verge of expanding, a friend’s son is mysteriously kidnapped by the military authorities. Agreeing to take on the case at great personal risk to himself and his family, Song begins to investigate the human rights abuses perpetrated by Chun Doo-hwan’s regime, leading to an explosive courtroom battle. The Attorney would be a great accomplishment for any filmmaker, yet as director Yang Woo-seok’s first film it is an incredible achievement. The skill with which he guides the story in no way conveys his novice status, as the pacing of the story and wonderfully fluid camerawork expertly absorbs the audience within the film. Furthermore director Yang’s subtle use of colours is continually highly effective, from the warm hues of the family homestead to the washed-out palette used for scenes of torture. The impressive technical prowess is bolstered by a very well written and extremely well paced script, one that subtly guides the audience through the issues of 1980s Korea (and more specifically, Busan) by way of the struggles of attorney Song Woo-seok. While the film is concerned with human rights abuses, such scenes are only introduced after considerable time has been spent constructing the protagonists, heightening the impact of events significantly. As such it is impossible not to invest in Song’s plight, and the approximately two hour running time simply flies by. 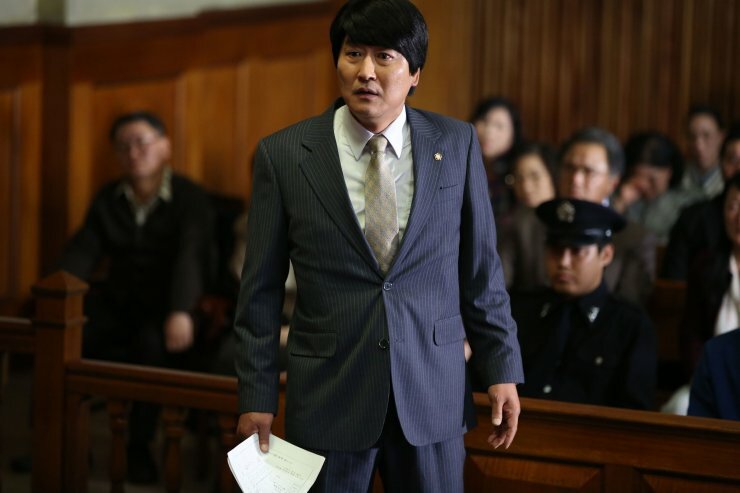 It is impossible to discuss The Attorney without mentioning Song Kang-ho’s electric performance. Song has a remarkable gift for making his characters likeable and relatable and as the titular lawyer, he consistently conveys a man of dignity who strives for better for himself and his family. Song infuses the role with morality and determination to succeed in conjunction with a comic humility that is ever-endearing, from the rags-to-riches story of his early years through to his successes as a top attorney in Busan. As such, his outrage at the incarceration and torture that transpires is truly palpable while his battle against the insurmountable odds is poignant and inspiring. Song Kang-ho is also supported by a great cast including the ever-reliable Oh Dal-su – once again in a comic sidekick role – as well as Kim Yeong-ae as a humble restaurant owner. Kim’s performance in particular is incredibly moving following her son’s disappearance, restraining her desperation perfectly as to not step into the realm of melodrama. Kwak Do-won steps into his villainous role with great aplomb as the wonderfully vile as the chief anti-communist torturer. His arrogance and disdain for any who criticise Chun’s military regime makes him the perfect love-to-hate scoundrel, yet the basis on real life events grants a potency that cannot fail to instill anger. While powerfully moving, The Attorney does have issues. Ironically while the film itself is based on Roh Moo-hyun’s life, the change of name for the lead role insinuates that censorship and freedom of expression are still under threat in contemporary Korea. The torture sequences, so expertly achieved in director Chung Ji-young’s National Security, don’t contain the same gravitas as to convey the horrors of Chun’s regime and what’s at stake in Song’s/Roh’s crusade against injustice. These are small points, yet ones that make The Attorney just shy of greatness. Based on the early years of former president Roh Moo-hyun, The Attorney (변호인) is a powerful and utterly absorbing court room drama. Director Yang Woo-seok’s debut is wonderfully structured and character-centered, with the exploration of human rights abuses during the Chun Doo-hwan regime naturally emerging through the story that unfolds. Featuring a brilliant performance by Song Kang-ho as the titular lawyer, The Attorney is a timely and poignant film that cannot fail to incite emotional resonance.